Call me crazy, but I’m always a big fan of treasure hunter films and stories. I’m talking about the ancient history turned to modern clues like in any Indiana Jones movie, or National Treasure, or the Tomb Raider or Uncharted video games…I love it because it has the potential of at least seeming like something you could personally investigate yourself. Blending fact with urban legends like that is really special if you can actually do it properly. As Above, So Below is one of those films that I really wanted it to work out for, because it begins brilliantly – but the one problem this film faces is that stupid “horror” word which is smack dab in the middle of the main genres – and it’s that one single word that ruins, practically, the whole thing. 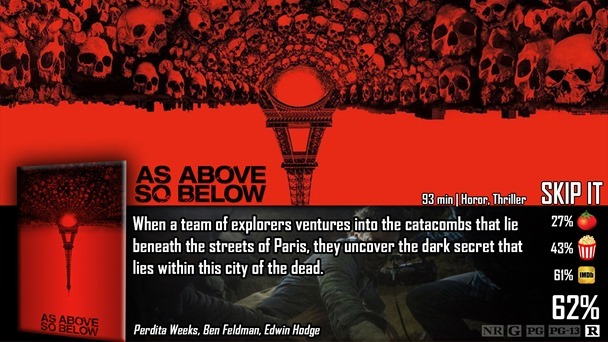 This film stars Perdita Weeks as a professor of…something that has had a huge fascination with the history of the world – and she risks her life finding information which would lead her into the catacombs underneath Paris, because she believes that she just paved the way to finding the legendary Philosopher’s Stone. You know the stone, it was in Harry Potter before they changed the title to Sorcerer’s Stone. This stone has a ton of magical properties, including the ability to grant someone immortality. Only, her group of explorers must go through great obstacles and tribulations in order to find it. Fantastic concept, I have to admit. The only time I thought I’d ever see anything about the Philospher’s stone was in Harry Potter, and that story is a little skewed to fit into their own universe. This is more about the actual legend, and the way this film was written to seem realistic in going from clue to clue was smart and exciting. Maybe not as exciting as Indiana Jones, but I kid you not, if you ignore the fact that the girl’s name is Scarlett, you can literally, and I mean literally, believe that this is instead – the best Tomb Raider movie to have ever existed. She has the look, the voice, the accent, the knowledge and intellect to solve clues, and heck – even her hairstyle is perfect. I’d be lying if I said at least a little bit of this film didn’t look like it derived a great deal of inspiration from the popular video game series. Unfortunately, again, you have the word “horror” sitting on the genre pool, and you’re just waiting for what you know to expect – to happen…and it does. Look, the first thing this film’s tone gives off is something similar to Descent. You will expect to see some kind of creature feature and cheap scares – which do happen…but not exactly in the way you’d imagine – but still unnecessary. The film was going really good for the first two thirds…the last third is just stupid. Let’s talk about found-footage, as this film is made as your basic, run-of-the-mill fake documentary. I have to say that when it comes to found footage, I’ve seen way worse, folks. They actually did a really good job keeping true to what found footage would actually look like unedited – which means the thing going black while under blankets, or during cave-ins, or what have you. There are no weird cuts or camera angles, it’s all pretty decent in that aspect – but again – not necessary for this film. I sort of get why they did it, but this is the kind of movie that has a better chance at grabbing my focus without using a set of cameras as plot devices. As Above, So Below actually has a few good positive attributes that most people probably won’t really understand. 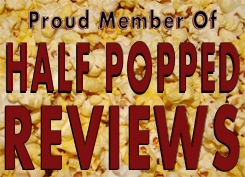 It stands on a very firm and smart foundation, which is key to an awesome premise, which this film definitely has. The acting wasn’t bad, really, and the writing for what they were going for was smarter than I ever thought possible for this film. For some reason that I don’t understand, they wanted to make this thing a horror, when the thing was absolutely fascinating without the horror element. With the element, it becomes something very – very stupid in the last third that loses my attention and interest into what’s going on overall. You had me up until ‘found footage’. I love the concept but i can’t stand the shaky camera stuff. I hear this a lot…shaky cam. What’s so bad with shaky cam? It’s just another tool of filmmaking that strikes a different set of audience members. I filmed movies with my family, and that’s what showed up – “shaky cam”, so I identify with it really nicely. However, when everyone else wanted to do what Blair Witch did, that’s when it got bad. People didn’t know HOW to make a professional movie look amateur. They would have shots that didn’t make any sense, too perfect of cuts…you know – behind-the-scenes stuff. I don’t mind an amateur-feel. The #1 priority I think a movie should have is bringing the audience member in and making them forget they are in the theater. I’m bored as well, but I have faith that smart filmmakers can revive it when they need to. The first Paranormal Activity I loved, the rest are crap. Blair Witch I liked, Cloverfield is spectacular, and I also liked Chronicle for what it’s worth.